On the hunt for the best floor mop for tiles? A popular flooring option for kitchens and bathrooms, tiles are not just stylish, but they're also easy to clean and maintain. If you’ve recently invested in a tiled floor for your home or you’re finding that your current cleaning routine just isn’t getting the job done, you may be wondering what the best floor mops for tiles are. We’ve created a list of the best floor mops for tiles, from steamers that use the power of steam to hygienically clean your floors, to spin mops that allow you to control how much water the mop retains. Looking for more help when it comes to keeping your house clean? Head to our cleaning hub page for tons of advice and plenty of product recommendations. We've also rounded up the best floor mops for cleaning hard floors, too. Best places TO BUY the best MOPs? Floor tiles are, typically, convenient to take care of. It’s part of their attraction – no frantic rubbing as you desperately try and work out a red wine stain, no embedded dirt and no discolouration. You’ll be pleased to hear that granite, slate, glazed porcelain and ceramic tiles are the easiest to look after, as they’re hard wearing, durable and aren’t susceptible to damage from water or abrasive mop heads (this makes them the best floor choice for busy households). You can use any type of mop on these materials. Which tiles to be careful with? While limestone, marble and travertine look impressive, they are the most susceptible to water damage and staining, so special measures should be taken when keeping these particular tiles clean. For example, making sure that you use a floor cleaner that has a neutral pH, and using as as little water as possible are important steps to consider. While steam mopping limestone and marble is okay, experts say you should avoid doing it regularly, and instead go for a well-wrung regular mop to transfer as little water as possible. When you’re looking for the best floor mops for your tiles, you should also look out for the material of the mop head. The most popular choice is microfibre, as it's soft, hygienic and fast drying. Some mop heads are slightly abrasive and are made from stainless steel, plastic and microfibre. While these are excellent at removing stains and embedded dirt, they shouldn’t be used on limestone or marble as they’re too abrasive. Sponge is also a good choice for a budget option, and is okay for flat untextured tiles. If you’re not keen on using harsh chemicals, or you simply don’t want the additional expense, this steam mop for tiles uses water to sterilise your floors. A steam mop is suitable for using on most floor tiles regularly, but to be on the safe side, should only be used intermittently on limestone or marble. It takes 30 seconds to heat up, and a whole tank of water lasts 15 minutes, which should give you enough time to tackle your tiled floors. To make cleaning floors as efficient and easy as possible, the less water the mop head retains the better. With that concept in place, spin mops are now the best choice if you’re looking to go down the more regular mop route, as they use centrifugal force to ring the mop of all its excess water. This spin mop from aptly named, Mopnado, is well received among users, with touches such as a wheeled bucket, hand-driven spin drive and both microfibre and scrub brushes included. In our opinion, if it's a spin mop you're after, this is the best floor mop for tiles. For those who simply want to get the job done quickly and well, this is the best floor mop for tiles. There’s no bucket and no running hot water involved. All you need to do is squeeze the trigger to spray the floor, then give it a good scrub using the absorbent microfibre pad. Bona Stone report that the cleaning liquid is suitable for stone and marble, as well as the more durable materials, making it a safe choice all round. While it may lack the finesse of our second pick, it’s still got some really great features that make it a good mop for all types of floor tiles. The centrifugal spin force is created by the foot pump, and ensures that the mop is rinsed of all excess water before wiping. It also features a splash guard to ensure water is retained, a pivot mop head so you can clean under furniture and a washable microfibre pad. The best floor mop for tiles if you're after a spin version on a budget, we think. So long as your tiles are flat and aren’t made from limestone or marble, this sponge mop should be an effective buy. Because the sponge is flat, it won’t clean textured floors properly, but it should do an efficient job of cleaning everyday tiles, such as granite and porcelain. According to Vileda, it’s particularly effective at picking up hairs, and the slightly abrasive sponge should be good at removing stubborn dirt. Bathrooms in particular often require a good scrub. 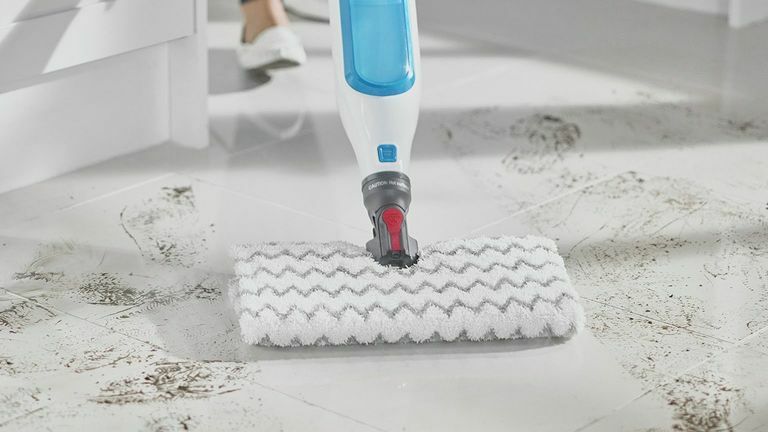 This tile scrubber from Oxo is effective at cleaning both floor and wall tiles, thanks to the head’s abrasive nature. It features an extendable pole so you can scrub even the highest tiles, while its angled shape allows you to get into corners and behind sinks and toilets. Thanks to the pivot head, you should be able to get some good leverage to really work at the limescale, and you can easily buy replacements once the head is worn.